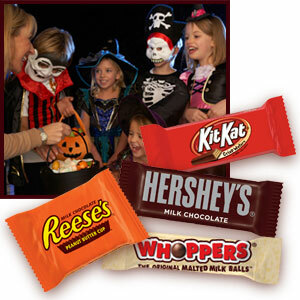 Trick-or-treaters will love choosing from classic Hershey’s Milk Chocolate Bars, creamy Reese’s Peanut Butter Cups, crispy Kit Kat Crisp Wafers, and crunchy Whoppers Malted Milk Balls. No Trick – Just Treats! Trick-or-treaters will think your house is the best on the block when you hand out these assorted candies. This assortment of chocolate candy is perfect for piñatas and candy scrambles! Treat yourself and others by keeping this deliciously diverse assortment in candy dishes at home and work. The story of Hershey’s Chocolate begins with Milton S. Hershey. Raised as a poor farm boy, Hershey became fascinated with chocolate-making at the 1893 World’s Columbian Exposition. Hershey founded the Hershey Chocolate Company in 1894, and built the world’s largest chocolate factory in 1903. He then created the industrial town of Hershey, Pennsylvania, where workers enjoyed comfortable homes, inexpensive public transport, and quality public schools. 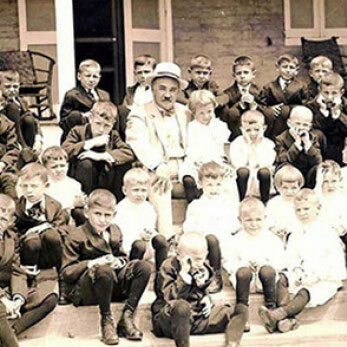 In 1909, Hershey and his wife established a school for orphan boys. Hershey eventually endowed the bulk of his wealth to this school, including ownership of the Hershey Chocolate Company. For more than a century, the Milton Hershey School has enriched the lives of countless children in need. The town of Hershey, Pennsylvania has provided employment, recreation, and culture, and The Hershey Company has brought smiles to people around the world. 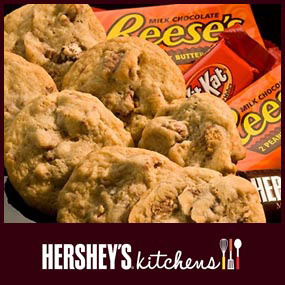 Bite into these cookies to discover a variety of Hershey’s flavors! Stir together flour, baking soda and salt. Beat butter, granulated sugar, light-brown sugar, and vanilla in large bowl with mixer, until creamy. Add eggs; beat well. Gradually add flour mixture, beating well. Stir in candy pieces and nuts, if desired. Drop by rounded teaspoons onto ungreased cookie sheet. Bake for nine to eleven minutes, or until lightly browned. Cool slightly; remove from cookie sheet to wire rack. Cool completely. Makes about five dozen cookies.